A modest shotgun house in New Orleans's Bayou St. John neighborhood shortly after Hurricane Katrina. Shotgun houses consist of three to five rooms in a row with no hallways and have a narrow, rectangular structure. Shotgun house in the Fifth Ward neighborhood of Houston, Texas, 1973, as pictured in a photo by Danny Lyon. 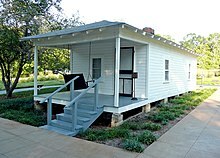 A "shotgun house" is a narrow rectangular domestic residence, usually no more than about 12 feet (3.5 m) wide, with rooms arranged one behind the other and doors at each end of the house. It was the most popular style of house in the Southern United States from the end of the American Civil War (1861–65) through the 1920s. 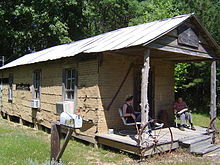 Alternate names include "shotgun shack", "shotgun hut", "shotgun cottage", and in the case of a multihome dwelling, "shotgun apartment"; the design is similar to that of railroad apartments. A longstanding theory is that the style can be traced from Africa to Haitian influences on house design in New Orleans, but the houses can be found as far away as Chicago, Key West, Florida, Ybor City, Tampa, and Texas. Though initially as popular with the middle class as with the poor, the shotgun house became a symbol of poverty in the mid-20th century. Urban renewal has led to the destruction of many shotgun houses; however, in areas affected by gentrification, historic preservation efforts have led to the renovation of such houses. Several variations of shotgun houses allow for additional features and space, and many have been updated to the needs of later generations of owners. The oldest shotgun houses were built without indoor plumbing, but this was often added later, often on the back of the house (sometimes crudely). "Double-barrel" or "double" shotgun houses consist of two houses sharing a central wall, allowing more houses to be fit into an area. "Camelback" shotgun houses include a second floor at the rear of the house. In some cases the entire floor plan is changed during remodeling to create hallways. 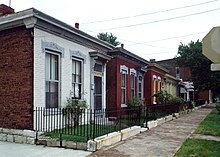 Shotgun houses spaced tightly together in Louisville, Kentucky. In cities, shotguns were built close together for a variety of reasons. The origins of both the term and the architectural form and development of the shotgun house are controversial, even more so in the wake of conflicting preservation and redevelopment efforts since Hurricane Katrina. A single shotgun in Avalon, Mississippi, was the house of Mississippi John Hurt, now a museum. New Orleans architectural historian Samuel Wilson, Jr. influentially suggested that shotgun-style houses originated in the Creole suburbs (faubourgs) of New Orleans in the early 1800s. He also stated that the term "shotgun" is a reference to the idea that if all the doors are opened, a shotgun blast fired into the house from the front doorway will fly cleanly to the other end and out at the back. Alternatively, folklorist and professor John Michael Vlach has suggested that the origin of the building style and the name itself may trace back to Haiti and Africa during the 18th century and earlier. Vlach claimed the name may have originated from a Dahomey Fon area term 'to-gun', which means "place of assembly". The description, probably used in New Orleans by Afro-Haitian slaves, may have been misunderstood and reinterpreted as "shotgun". Citing Vlach, James Deetz claimed archaeological support for an African origin in his dig at Parting Ways, a 1790s community of freed black slaves in Plymouth, Massachusetts; his shotgun interpretation of the extremely limited evidence – two rooms that "may or may not have been unified" – has been challenged as "premature". Vlach's theory behind the earlier African origin is tied to the history of New Orleans. In 1803 there were 1,355 free blacks in the city. By 1810 blacks outnumbered whites 10,500 to 4,500. This caused a housing boom. As many of both the builders and inhabitants were Africans by way of Haiti, Vlach maintained it was only natural they modeled the new homes after ones they left behind in their homeland. Many surviving Haitian dwellings of the period, including about 15 percent of the housing stock of Port-au-Prince, resemble the single shotgun houses of New Orleans. The shotgun house was popularized in New Orleans, and, as Fred Kniffen documented in a statewide survey of Louisiana house types in the 1930s, the greatest number are found dispersed from there in a manner that supports the diffusion theory. The style was definitely built there by 1832, though there is evidence that houses sold in the 1830s were built 15 to 20 years earlier. A simpler theory is that they are the typical one-room-deep floor plan popular in the rural south, rotated to accommodate narrow city lots. Such houses were built throughout hot urban areas in the South, since the style's length allowed for excellent airflow, while its narrow frontage increased the number of lots that could be fitted along a street. It was used so frequently that some southern cities estimate that, even today, 10% or more of their housing stock is composed of shotgun houses. The earliest known use of "shotgun house" as a name for these dwellings is in a classified advertisement in the Atlanta Journal-Constitution, August 30, 1903: "Two 3-room houses near the railroad yards at Simpson st. crossing, rent $12 a month to good tenants who pay in advance; price $1,200 on terms or $100 cash, balance $15 a month; a combination of investment and savings bank: these are not shacks, but good shot-gun houses in good repair." While this advertisement seems to present shotgun houses as a desirable working-class housing alternative, by 1929 a Tennessee court noted that shotgun houses could not be rented to any other than a very poor class of tenants. After the Great Depression few shotgun houses were built, and existing ones went into decline. By the late 20th century shotgun houses in some areas were being restored as housing and for other uses. 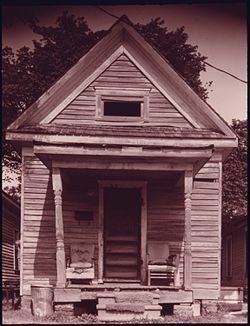 Shotgun houses were often initially built as rental properties, located near manufacturing centers or railroad hubs, to provide housing for workers. Owners of factories frequently built the houses to rent specifically to employees, usually for a few dollars a month. However, by the late 20th century shotguns were often owner-occupied. For example, 85% of the houses (many of them shotgun) in New Orleans' Lower Ninth Ward were owner-occupied. Shotgun houses were most popular before widespread ownership of the automobile allowed people to live farther from businesses and other destinations. Building lots were small, 30 feet (9 m) wide at most. An influx of people to cities, both from rural areas in America and from foreign countries, all looking to fill emerging manufacturing jobs, created the high demand for housing in cities. Shotgun houses were built to fulfill the same need as rowhouses in Northeastern cities. Several were often built at a time by a single builder, contributing to their similar appearance. The rooms of a shotgun house are lined up one behind the other, typically a living room is first, then one or two bedrooms, and finally a kitchen in back. Early shotgun houses were not built with bathrooms, but in later years a bathroom with a small hall was built before the last room of the house, or a side addition was built off the kitchen. Some shotguns have only two rooms. Chimneys tended to be built in the interior, allowing the front and middle rooms to share a chimney with a fireplace opening in each room. The kitchen usually has its own chimney. Other than the basic floor layout, shotgun houses have many standard features in common. The house is almost always close to the street, sometimes with a very short front yard. In some cases, the house has no setback and is actually flush with the sidewalk. The original steps were wood, but were often replaced with permanent concrete steps. A sign of its New Orleans heritage, the house is usually raised two to three feet off the ground. There is a single door and window in the front of the house, and often a side door leading into the back room, which is slightly wider than the rest of the house. The front door and window often were originally covered by decorative shutters. Side walls may or may not have windows; rooms not adjoining the front nor back door will generally have at least one window even when the houses are built very close together. Typically, shotgun houses have a wood-frame structure and wood siding, although some examples exist in brick and even stone. Many shotguns, especially older or less expensive ones, have flat roofs that end at the front wall of the house. In houses built after 1880, the roof usually overhangs the front wall, and there is usually a gable above the overhang. The overhang is usually supported by decorative wooden brackets, and sometimes contains cast iron ventilators. The rooms are well-sized, and have relatively high ceilings for cooling purposes, as when warm air can rise higher, the lower part of a room tends to be cooler. The lack of hallways allows for efficient cross-ventilation in every room. Rooms usually have some decoration such as moldings, ceiling medallions, and elaborate woodwork. In cities like New Orleans, local industries supplied elaborate but mass-produced brackets and other ornaments for shotgun houses that were accessible even to homeowners of modest means. A double shotgun structure in the Uptown section of New Orleans. Double shotgun houses were a form of multiple-family housing, where essentially two conventional shotgun houses shared a central wall. A conventional one-story freestanding shotgun house is often called a single shotgun. Many common variations exist in high quantity, and are often actually more common than the single shotgun in cities. 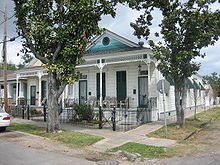 A double shotgun, also called double-barrel shotgun, is essentially two shotgun houses connected to each other and sharing a central wall. They are a form of semi-detached housing. The double shotgun requires less land per household than the traditional shotgun and was used extensively in poorer areas because it could be built with fewer materials and use less land per occupant. It was first seen in New Orleans in 1854. A camelback house, also called humpback, is a variation of the shotgun that has a partial second floor over the rear of the house. Camelback houses were built in the later period of shotgun houses. The floor plan and construction is very similar to the traditional shotgun house, except there are stairs in the back room leading up to the second floor. The second floor, or "hump", contains one to four rooms. Because it was only a partial second story, most cities only taxed it as a single-story house – this was a key reason for their construction. The double-width shotgun is an extra-large and -wide shotgun house, built on two lots instead of one. These were typically built one-to-a-block in locations where a single person would first buy the entire city block during development, then build themselves a double-sized home and subdivide the rest of the block with single-lot homes. A combination, the Double Camelback shotgun, also exists. A minor variation is a side door allowing access to the kitchen, or a porch along the side extending almost the length of the house. "North shore" houses are shotgun houses with wide verandas on three sides. They were so named because most were built on the north shore of New Orleans' Lake Pontchartrain as summer homes for wealthy whites. The term may also refer to a different structure, common in rural areas and small towns, which takes the form of a small, long, free-standing house, generally made of wood, with no hallways. Unlike the larger terraced version, this is generally a single-storied dwelling, but it was still associated with poverty and popular partially because of its ability to make hot weather more comfortable. This building style can also be seen in a double shotgun style, made for use by one or two households. Both styles were commonly used in sawmill towns where examples still exist. The construction of shotgun houses slowed and eventually stopped during the early 20th century. The increased affordability of two technological innovations, the car and consumer air conditioning units, made the key advantages of the shotgun house obsolete to home buyers. After World War II, shotgun houses had very little appeal to those building or buying new houses, as car-oriented modern suburbs were built en masse. Few shotgun houses have been built in America since the war, although the concept of a simple, single-level floor plan lived on in ranch-style houses. The surviving urban shotgun houses suffered problems related to those typically facing the inner city neighborhoods in which they were located. The flight of affluent residents to the suburbs, absentee owners, and a shortage of mortgage lenders for inner-city residents led to the deterioration of shotgun houses in the mid- and late 20th century. Confusing ownership, passed down within a family over several generations, also contributed to many houses sitting vacant for years. Though shotguns are sometimes perceived as being prevalent in poor African American neighborhoods, many originally constituted much of the housing stock of segregated white neighborhoods. Many of these neighborhoods became predominantly black during the 1950s and 1960s, but many others did not and remain predominantly white. Regardless of who was living in them, from World War II until the 1980s shotguns came to be widely viewed as substandard housing and a symbol of poverty, and they were demolished by many urban renewal projects. This thinking is no longer so prevalent, with cities such as Charlotte establishing "Shotgun Historic Districts". Shotgun houses have even been praised as quality and cost-effective cultural assets that promote a distinctive urban life. Other cities such as Macon, Georgia experimented with renovating shotgun houses for low-income residents and, though there was indecision on whether it would be cheaper to tear them down and build new housing, some were rebuilt. There are many large neighborhoods in older American cities of the south which still contain a high concentration of shotgun houses today. Examples include Third Ward in Houston; Bywater in New Orleans; The Hill in St. Louis; Portland, Butchertown and Germantown in Louisville; and Cabbagetown in Atlanta. Their role in the history of the south has become recognized; for example, in October 2001 Rice University sponsored an exhibition called "Shotguns 2001". This three-day event featured lectures on and artistic paintings of the houses, as well as presentations and panel discussions in a neighborhood of restored shotguns. In some shotgun-dominated neighborhoods, property value has become quite high, leading to gentrification. Sometimes, a new owner will buy both homes of a double-barreled shotgun structure and combine them, to form a relatively large single house. Shotguns are also often combined to renovate them into office or storage space. Elements of the shotgun style have recently been seen in a number of the compact, low-occupancy structures employed in the Solar Decathlon contests held periodically in Washington, DC. While some are erected from panels brought to the site, many such structures consist of enclosed single or multiple units designed specifically for road transports, with multiple modules connected on site, and compact linear structures often employ multiple-use "zones" rather than specifically private areas, while retaining a linear progression of spaces. In 2011 Louisville's daily newspaper, The Courier-Journal, reported that a local nonprofit agency devoted to building and renovating affordable housing was building new shotgun houses in a development in southwest Louisville. The shotgun house plays a large role in the folklore and culture of the south. Superstition holds that ghosts and spirits are attracted to shotgun houses because they may pass straight through them, and that some houses were built with doors intentionally misaligned to deter these spirits. They also often serve as a convenient symbol of life in the south. Elvis Presley was born in a shotgun house, Aaron Neville of The Neville Brothers grew up in one, and according to bluesman David Honeyboy Edwards, Robert Johnson died in one. Shortly before his death in May 1997, Jeff Buckley rented a shotgun house in Memphis and was so enamoured with it he contacted the owner about the possibility of buying it. Dream Brother, David Browne's biography of Jeff and Tim Buckley, opens with a description of this shotgun house and Jeff's fondness of it. One of the more widely known references to a shotgun house is in the 1980 Talking Heads song "Once In A Lifetime". The first line of the song is "And you may find yourself living in a shotgun shack". 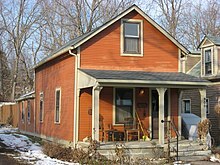 The John Mellencamp song "Pink Houses" was inspired when he was driving along an overpass on the way home to Bloomington, Indiana from the Indianapolis airport. There was an old black man sitting outside his little pink shotgun house with his cat in his arms, completely unperturbed by the traffic speeding along the highway in his front yard. “He waved, and I waved back,” Mellencamp said in an interview with Rolling Stone. “That's how 'Pink Houses' started.”. In Bruce Springsteen's song "We Take Care of Our Own", from the album Wrecking Ball, he refers to shotgun houses, singing "We take care of our own, from the shotgun shack to the Super Dome". ^ a b McAlester, Virginia & Lee (1997). A Field Guide to American Houses. New York: Knopf. p. 90. ISBN 0-394-73969-8. ^ Gist, Karen Taylor (March 20, 2010). "New Orleans has a love affair with shotgun houses". The Times-Picayune. Retrieved 4 July 2014. ^ a b c d e f g h The Shotgun house: urban housing opportunities. Preservation Alliance of Louisville and Jefferson Co. 1980. ^ Tudor, Phoebe (March 1987). "The Development of the Shotgun House". New Orleans Preservation in Print. Preservation Resource Center of New Orleans. 14 (2): 4–5. Retrieved 4 July 2014. The truth is that even among experts in the fields of architectural history and cultural geography, no one is exactly sure how the shotgun house came to look like it does and get that funny name. ^ Wilson, Jr., Samuel (1974). New Orleans Architecture, Volume IV: The Creole Faubourgs. Pelican Publishing. p. 71. ISBN 978-1-56554-130-6. Retrieved 4 July 2014. A projectile discharged from a gun aimed through the front door would presumably travel unimpeded through the house, and emerge from the rear; thus the derivation of the name. ^ a b c d e Vlach, J: "Shotgun houses", pages 51–57. Natural History 86, 1977). ^ Campanella, Richard (February 12, 2014). "Shotgun geography: the history behind the famous New Orleans elongated house". The Times-Picayune. Retrieved 30 April 2016. The distribution of shotgun houses throughout Louisiana gives indirect support to the diffusion argument. Kniffen showed in the 1930s that shotguns generally occurred along waterways in areas that tended to be more Francophone in their culture, higher in their proportions of people of African and Creole ancestry, and older in their historical development. Beyond state boundaries, shotguns occur throughout the lower Mississippi Valley, correlated with antebellum plantation regions and with areas that host large black populations. They also appear in interior Southern cities, most notably Louisville, Ky., which comes a distant second to New Orleans in terms of numbers and stylistic variety. If in fact the shotgun diffused from Africa to Haiti through New Orleans and up the Mississippi and Ohio valleys, this is the distribution we would expect to see. ^ Kniffen, Fred B. (1936). "Louisiana House Types". Annals of the Association of American Geographers. Annals of the Association of American Geographers, Vol. 26, No. 4. 26 (4): 179–193. doi:10.2307/2569532. JSTOR 2569532. ^ Moore v. Minnis, 11 Tenn.App. 88 (Tenn. App. 1929). ^ a b c d Starr, S. Frederick. The New Orleans Shotgun: Down but Not Out. New York Times. September 22, 2005. pg. F.7. ^ Marling, Karal Ann (1996). Graceland: going home with Elvis. Harvard University Press. ISBN 978-0-674-35889-8. Archived from the original (Excerpt) on 2002-02-13. Retrieved August 10, 2010. ^ Marling, Karal Ann (1996). Graceland: going home with Elvis. Harvard University Press. p. 17. ISBN 978-0-674-35889-8. Retrieved August 10, 2010. ^ a b Holl, Steven (November 1, 1995). Pamphlet Architecture 9: Rural and Urban House Types. Princeton Architectural Press. pp. 34–39. ISBN 978-0-910413-15-2. Retrieved 2010-07-01. ^ a b Elson, Martha (June 20, 2011). "Louisville's endangered shotgun houses targeted for preservation". The Courier-Journal. Retrieved June 22, 2011. ^ Roney, Marty (July 2, 2005). "Old shotgun homes given new purpose". Montgomery Advertiser. p. 1. ^ Mason, Bobbie Ann (2007). Elvis Presley: A Life. Penguin Books. p. 11. ISBN 0-14-303889-3. Retrieved 2010-07-01. ^ Marling, Karal Ann (Autumn 1993). Elvis Presley's Graceland, or the Aesthetic of Rock 'n' Roll Heaven, American Art, Vol. 7, No. 4, pp. 72–105. ^ Arroyo, Raymond (September 2001). "The Devotion of Aaron Neville". Crisis Magazine. Archived from the original on 2007-10-11. Retrieved 2010-06-15. ^ Styles, Sean (2001). Trail of the Hellhound - Delta Blues in the Lower Mississippi Valley: Delta Sites, U.S. National Park Service. Retrieved April 4, 2006. ^ John Hammond Jr. (Host), David Hunt (Prod., Dir.) (1991). The Search for Robert Johnson. Iambic Productions (Television production). Channel 4. Event occurs at 40:08. Archived from the original (Flash video, 52:26) on 2012-11-08. David Honeyboy Edwards indicates a yellow shotgun house where he says Robert Johnson died. ^ Browne, David (2001). Dream Brother: The Lives and Music of Jeff and Tim Buckley. HarperEntertainment. p. 1. ISBN 978-0-06-107608-4. ^ Gittins, Ian (2004). Talking Heads: once in a lifetime : the stories behind every song. Hal Leonard. pp. 68–69. ISBN 978-0-634-08033-3. 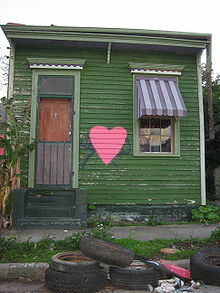 Wikimedia Commons has media related to Shotgun houses.